Magnolia Mamas : 'Tis the Season to Give...Wine! Tis the season to give wine! Well any season is a good season to give wine in our books, but we're going with it. This year I feel like the holidays are coming upon us at warp speed. We've been bouncing from one fun holiday event to the next, wrapping up these last weeks of school, and attending all of the end of year performances for our extracurricular activities. In between, I've been a gifting and wrapping holiday tornado. My guest room looks like Christmas exploded in it, and I'm not sure at this point some of the glitter isn't permanent. Pausing for a moment - What does one get a Master? New kicking boards? Meditation music? A shiny new sword? I feel like a gift card to Target is largely inappropriate? Suggestions welcome! You get the idea - the list is long. 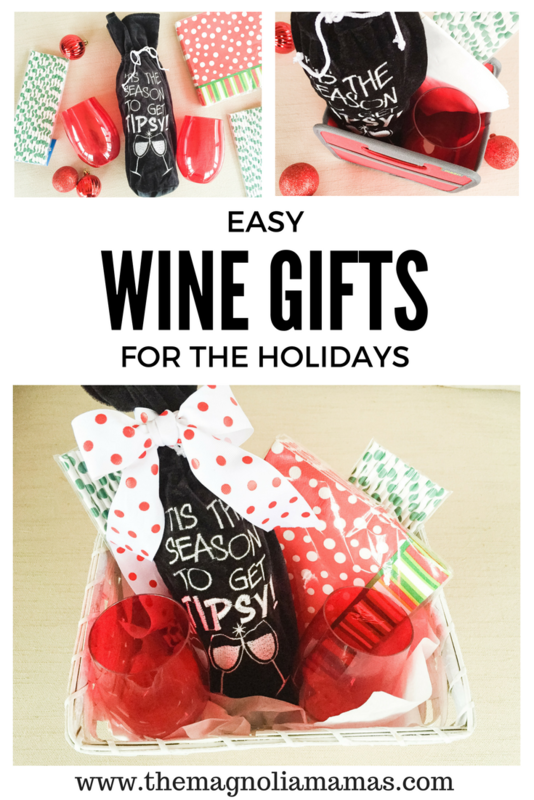 One gift idea that came easily was our neighbors and a few friends - a wine gift! I mean who doesn't like wine?!? Especially if you are my neighbor. My neighbors LOVE them some wine. I think it's in the HOA covenants that you couldn't move in the neighborhood unless you were a lover of all things grape related. 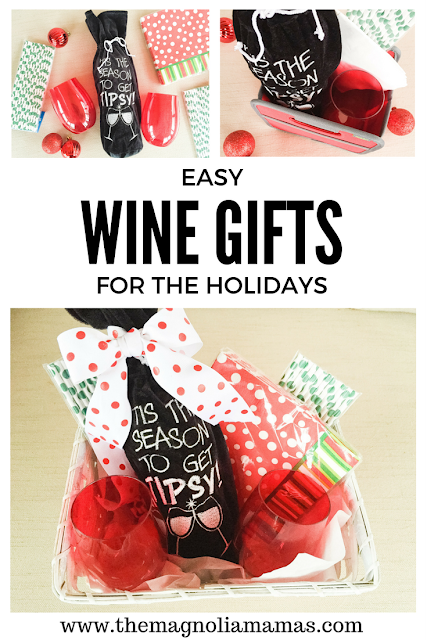 I was inspired with this year's wine gift when I was ordering some party supplies from Oriental Trading for The Cutes school holiday parties. I was in the process of ordering holiday cups, and stumbled upon this fun "Tis the Season to get Tipsy" wine gift bag. It was like a sign straight from Kris Kringle himself. After looking around the site a little more I realized I could make a wine themed gift with just a few clicks. I was so excited when all of the fun supplies arrived. I purchased everyone's favorite wines, and started putting together each one's gift. Now in some of my neighbor's homes only one person is a wine drinker, so I decided to make two different sizes depending on each one's interests. For the smaller gift baskets, I ordered a bunch of my favorite organizers in red - that way it's also part of the gift itself and something useful to keep beyond the holidays. The mini Meori organizer is the perfect size. I was able to include the wine, one of the red stemless wine glasses, the cocktail napkins, and some fun straws - with plenty of room if I wanted to add some cheese or a treat or two. The interior of the organizer has built in pockets, so it makes everything super easy to wrap and keep in place during transport and delivery. I wrapped everything up in my favorite go-to easy wrapping - baking treat bags (That's right, I said treat bags. It makes it so easy to wrap things like this! ), and topped it with a red polka dot bow. Then it was off front porch delivery. For the larger couples gifts, I used a white basket and included two of the red stemless wine glasses, two sets of straws (just for fun), and a set of fun polka dot holiday napkins. I had originally ordered the small organizers for these but they ended up being just a little too large for the gift unless I added a lot of treats and extras. I wanted to keep the gift simple and easy, and didn't want to stress so I just went with the smaller baskets. It's been such a fun gift to give, and one I know I will repeat for years to come - because, again, who doesn't like a good wine gift? Looking for a good deal on goodies like this to create gift baskets from Oriental Trading? Be sure to check out their coupon page for the latest deals! What are some of your favorite gifts to give your neighbors and friends?